We like to describe this fun outdoor furniture collection by Onyx as “sculptural rattan.” Designed by Gaetan Van de Wyer, a traditional woven material takes on the most modern forms that are as artistically inclined as they are inspired by nature. The Oxbow sofa features organic lines and offers seating for three – an essential for your modern outdoor lounging area. Pair it with the Just C! coffee table, which fittingly takes the shape of a “C” and provides a place to put your drink or a beautiful potted plant. For something a little different, check out the Moebius double armchair – a cozy spot for two. And then there’s the Klein chair, the Spoon chair and the Bulb chair with a built-in lamp, both making a fun addition to your favorite book nook. The Loop and Hula-Hoop stool and coffee table make a great pair indoors and out. And end the collection with a Dot – the Dot stool that is, a great piece inside, outside, in any corner, it’ll get lots of use and look great too! Check out this modern outdoor furniture collection by visiting Onyx. Vitra introduced several new products for 2010, amongst which the Suita Sofa by Antonio Citterio is of the most interest to us. While by itself it’s a fairy simple design, it comes with limitless versions, added features, colors and fabrics as a bonus. This Suita’s simplicity and versatility allows for a multitude of modern, elegant living room arrangements ranging in style from classic modern to whimsical and eclectic, all shown on these many lovely photos … Contact Vitra for details. Italian company Runtal is making a splashy statement with its hot new home wall hung radiator design appropriately dubbed the “Splash” radiator. 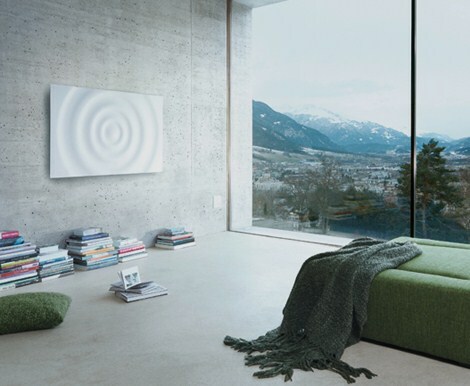 Made of Corian, this innovative new wall radiator was designed by Christian Ghion, ushering in the next era of home decor – fashionable, functional art. The Splash radiator features a chic ripple motif, integrating movement and a modern aesthetic into this unusual home essential. This Zen-style fixture makes a simple yet striking addition to any contemporary room. And while you may be drawn by its cool looks, you’ll stay for the warm comfort. The Splash home radiator is a must-see! Check it out at Runtal. The famous kitchen brand Franke has revolutionized the way we see the kitchen sink. No longer just a utilitarian element, new and innovative designs have transformed this fixture into a beautifully functional work of art. The Polyedra sink has as big an impact from above the counter as it does from below. A simple, square sink blends seamlessly with the countertop featuring a dramatic black finish. Beneath the counter, the sink’s underbelly becomes a multi-faceted diamond-cut monument to modern style. 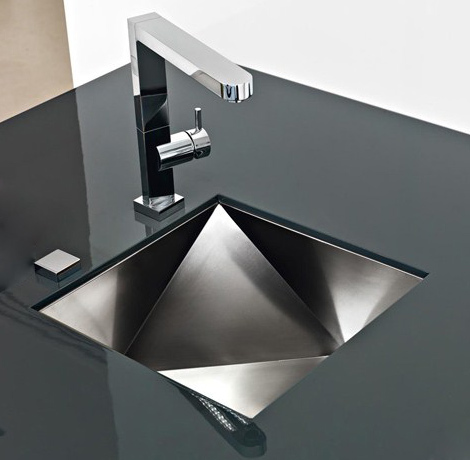 The Polyedra sink comes in two additional designs and all have varying methods of installation, so this sink will suit a variety of different spaces. Check it out by visiting Franke. It’s “ship-shape” – literally! 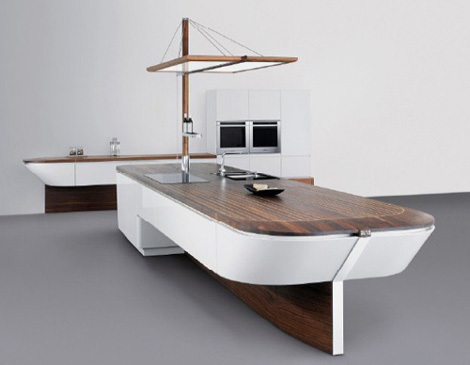 Take the nautical trend to the next level with this chic ship-inspired kitchen by Alno. The modern maritime-style Marecucina kitchen boasts beautiful wood details and an artfully shaped countertop, skirted in clean, white cabinets that provide plenty of stylish storage – out of sight, out of mind. A lighting panel is integrated into the mast. Complete the look with ultra-modern chrome hardware, or take it to new heights of luxury with a stunning gold faucet and accessories. The look is ideal for minimalist kitchens, but it quickly takes center stage in any home. For more information on this cook kitchen, visit Alno. The new +Artesio kitchen by Poggenpohl was designed in collaboration with renowned German architect Hadi Teherani. The architectural detail of this modern, minimalist kitchen speaks volumes about the original approach to its design. “The furnishing of a kitchen is not just about fitting it with furniture and equipment. It’s about creating structures that can be lived in,” according to the manufacturer. “In much the same way as a house opens and closes to the outside world, so too the kitchen communicates with its environment, bringing the room to life.” Indeed, this kitchen really is a showpiece of the home instead of just a room in it. It’s harder deciding what the most beautiful features are – what you can see outright (the sleek countertops and cabinet faces) or what you can’t (i.e. all the storage space), the integrated lighting and the striking way it all takes shape. 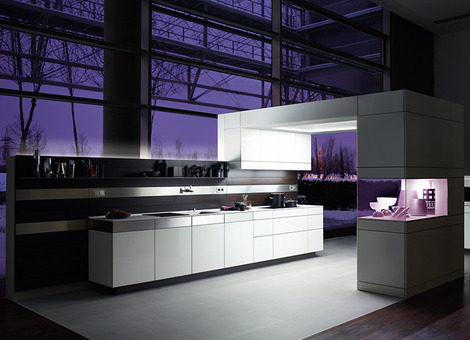 Launched at Eurocucina in Milan this spring, the +Artesio kitchen will be available in the U.S. in January 2011. For more info visit Poggenpohl. Designers are taking the cowboy trend off the runway and into our homes, with the authentic look and feel of this modern cowhide furniture, by Kyle Bunting. And like the trendy fashions for clothing, this line of new Hide Furniture has a modern twist. Hide ottomans come in a full range of colors, from natural variations of brown to vibrant reds, greens and hot pinks. The wood base is finished with matching paint. Pair it with a Hide chair, a cozy place to curl up. If you’re looking for something in a table, the collection offers two – the round “Clutch” table, the “Runway” cocktail table and the “Jetstream” console table. 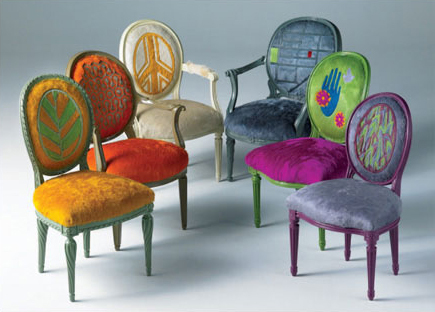 But beyond the basics, this cool cowboy-chic collection offers Art chairs, which are really different, classifiable and “art you can sit on.” Any style, from Louis the XVI chairs to sophisticated armchairs in any color, any pattern imaginable. And the ideal addition to a modern sitting room or dressing room would be a Neu screen, a stunning room divider. Complete your room with some cowhide art, featuring modern graphics and the hottest hues – if you thought the Art chairs were fantastic, check this out! For more information visit Kyle Bunting. Indulge in warmth and beauty as Stone Forest invites you to take the bath and spa ritual to the next level. 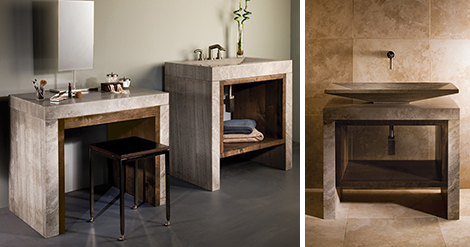 Introducing Stone Forest’s first full suite bath sculpture collection – Siena. Launching in summer 2010, this exclusive comprehensive suite of contemporary, sculptural forms is designed specifically for the home and spa. The contemporary Siena Collection combines minimalist design with Italian sensibility. Hand-carved from rare blocks of Siena Silver-Grey marble, a striking unique material with subtle smoky tones and natural contrasting striations, this process (both natural and with the skillful eye of the stone-smith) allows for the inherent beauty of the stone to be expressed without embellishment. Even more unique with Siena marble is the web-like inclusions that run contrary to the horizontal veining. Hewn and fitted with painstaking care, the collection offers elegant, simple geometric shapes with select pieces featuring alder wood inlays. This fresh set of seven designs establishes an elegant setting for your luxurious bath experience. Style and comfort, could it be true? Les Femmes is a comfy lounge sofa by Saba Italia that doesn’t compromise looks, proving you really can have your couch cake and eat it too. Not only is this lounge sofa comfortable to sit on, it’s easy to place, even in hard-to-furnish corners and small spaces, thanks to its modular design and movable armrests and backrests. Complement the look and feel with the armchair and an ottoman or two for added convenience, comfort and extra seating! 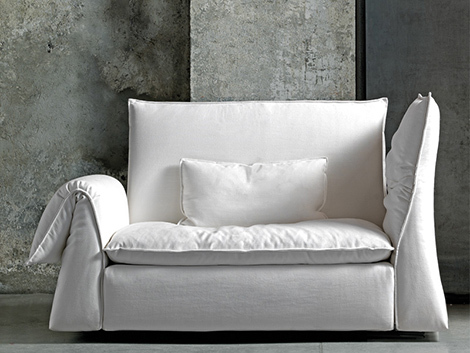 For more on this comfy sofa visit Saba Italia. Wow, these kitchens are wild! 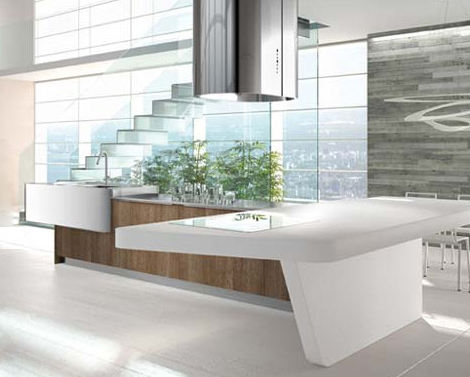 These modern laminate kitchens by Arrital come in modern high-gloss colors, or take the natural (but still ultra-contemporary) route and go for the wood look. The doors are coated with laminate, and are available in nine finishes, suited to every style. Choose from three wood finishes for an au naturel appeal, three solid opaque-colors for deep drama, and three glossy colors that bring a clean, modern look to your workspace. Finish the room with stainless steel appliances and some real show-stopping chandeliers, and they’ll be begging for seconds! Check out these laminate kitchens at Arrital. Make a modern welcome to your home with these artistic door design ideas by Bertolotto. This innovative Italian company created these cool, contemporary cast-glass doors that reflect light and movement. Of seven models, each boasts its own unique pattern and color. Dunned “art doors”, each one is signed by its artist, Elio Garis, transforming it into a unique work of art. 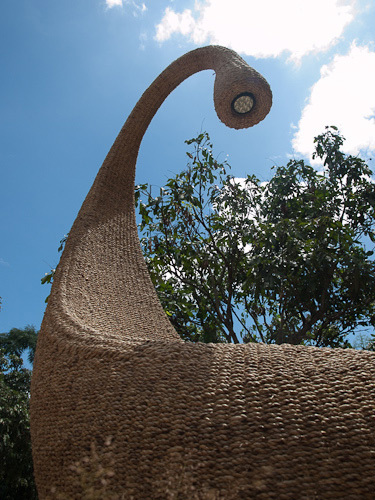 But unlike more traditional artworks, this one is displayed for the whole neighborhood to admire (and envy)! Custom-made doors are available on request. 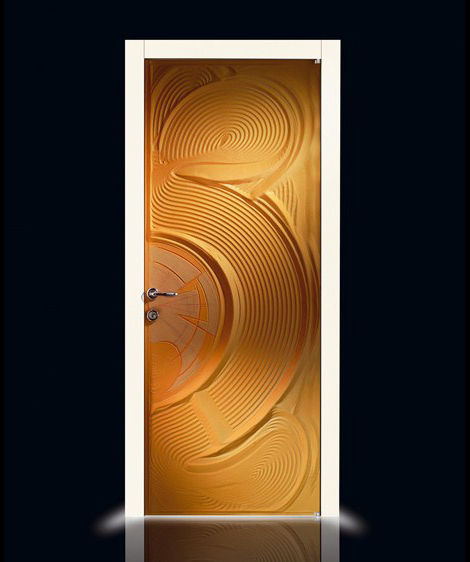 Check out these modern artistic door designs at Bertolotto. 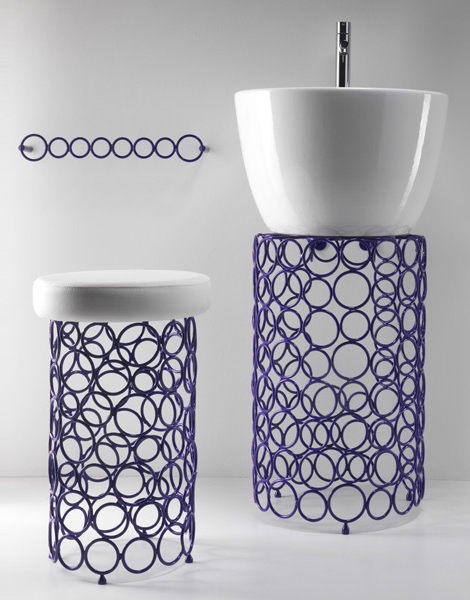 For something a little different with a lot of pizzazz, check out the modern Maaloo bathroom accessories by Italian bathroom brand OML. These stainless steel ring designs feature circles in various sizes, fastened together to form the base of a stool, sink and towel rack – very contemporary, very coordinated, very cool! Finished in a variety of hot hues, these steel bathroom accessories will bring a funky look to your bathroom. Jazz up your minimalist design; make the most of your small space for a modern aesthetic. For more info visit OML. Italian bathroom brand Fir Italia introduces a new way to shower with these ultra modern bathroom ideas. This shower system incorporates light, color and water to stimulate the muscles and the imagination. These cool bathroom designs feature a mix-and-match collection of bathrooms suites – contemporary white vanities and countertops complemented by illuminated mirrors, ceiling lights and rain-shower panels – how luxurious! Available in three square sizes (500mm, 700 and 1,100 mm) and in a range of colors, you can set the tone for how you want to wake up or wind down. 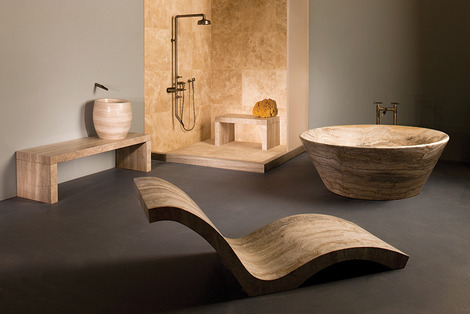 For more details on these ultra-modern bathrooms, visit Fir Italia.